The oldest colour system known today that’s worth its name originates from the Finnish born astronomer, priest and Neoplatonist Aron Sigfrid Forsius (died 1637), sometimes also known as Siegfried Aronsen. Forsius became Professor of Astronomy in Uppsala (Sweden) in 1603, later moving as a preacher to Stockholm and beyond. He was removed from office in 1619, after being accused of making astrological prophesies. 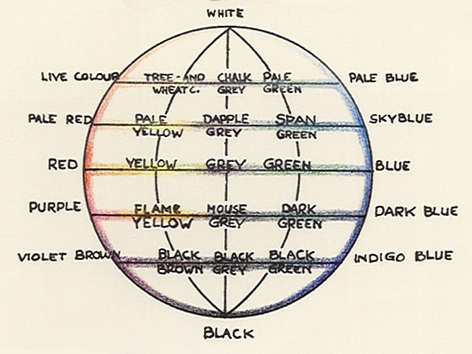 In other words, Forsius had the idea of introducing four basic chromatic colours, applying for each colour a grey scale which runs from bright to dark along the central axis of the sphere. The colours on the sphere’s surface are arranged in such a way that three opposing pairs are created: red and blue, yellow and green, white and black. Forsius’ colour sphere was just one of the widespread attempts made in the 17th century to create comprehensive colour scales, partly undertaken to enable very exact differentiation between the various styles of painters. A technical problem which initially remained unsolved — also in Forsius’ case — concerned a coordinated relationship between the two parameters colour hue and colour value (or brightness). Pure yellow is simply brighter than unmixed blue. In 1677, the English doctor Francis Glisson is credited with the creation of a colour-solid which, in this respect, was both coherent and of sufficient quality to become the ancestor of all colour systems of the New Age. According to John Gage in his Culture and Colour, the success of this undertaking has unfortunately not been substantiated. Glisson operated with the primary colours red, yellow and blue, and his grey scale was composed of 23 steps between black and white, which he constructed using lead-white and black ink. Scientific progress would soon surpass those mixtures developed by Glisson in his «scale for red» (Scala Rubedenis) or his «scale for black» (Scala Nigredinis) — progress initiated by experiments conducted even while Glisson was mixing his pigments. And as we shall soon see, at the end of the 17th century in Cambridge, Newton separated the white light of the sun, to subject the colours to the scrutiny of physics. Date: The system originated in 1611 in a text by the author on physics. Bibliography: S. Forsius, «Physica», published by J. Nordström, Uppsala Universitäts Arsskrift, X, 1952; «A. 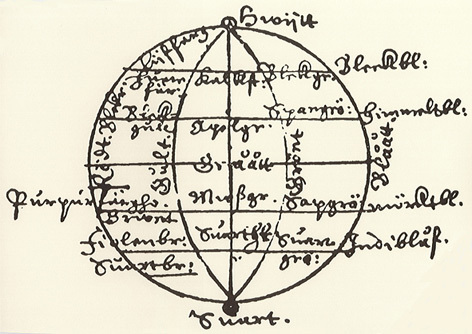 S. Forsius, Physica Manuskript, 1611», published in 1971, ACTA Bibliothecae Regiae Stockholmiensis, pp. 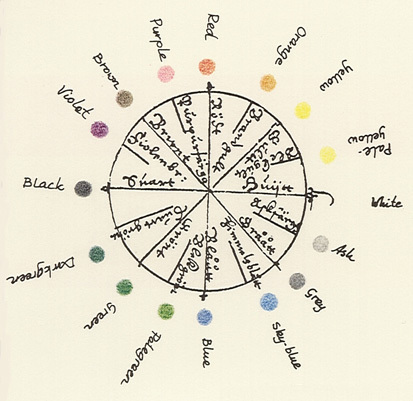 315-321 (1971); C. Parkhurst and R. L. Feller, «Who Invented the Color Wheel?, Color Research and Application 7», pp. 217-230 (1982); John Gage, «Colour and Culture, Practice and Meaning from Antiquity to Abstraction», Thames and Hudson, 1993, p. 166 (mention and comment).